The death of Richard Rutt in England on July 27 deserves to be recorded in Korea. He was deeply attached to this country, to which he devoted the central years of his life. Born in England on August 27, 1925, he came to serve in Korea as an Anglican priest in 1954. For many years he lived alone in remote rural villages where traditional ways were still being practiced. In 1966 he was appointed Assistant Bishop of Daejeon and in 1968 he became the Bishop of Daejeon. The next year he married Joan Ford, a teacher he had known for many years. She too came to love Korea and edited a Korean cook book as well as the autobiography of the last Korean Crown Princess. In 1973, feeling that the time had come for Koreans to take charge of their portion of the Anglican Communion, he offered his resignation as Bishop of Daejeon, intending to serve as a simple parish priest in the country he had come to love so much. 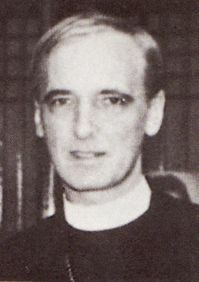 That proved to be impossible and in 1974 Richard Rutt returned to England and became suffragan bishop of the Diocese of Truro. While in Cornwall, he learned the Cornish language in order to celebrate weddings in Cornish. In October 1979 he was named Bishop of Leicester and as such, in 1985, was introduced into the House of Lords. He retired in 1990 and went to live in Falmouth, Cornwall, which he had come to love. In 1994 he and his wife became Catholics and in June 1995 he was ordained as a Catholic priest. His wife Joan's health declined and she died in Falmouth in 2007. Father Rutt spent his last years at St. Mary Immaculate Parish in Falmouth. In 2009 he was made a Prelate of Honour by Pope Benedict XVI. He was an honorary canon of Plymouth Cathedral. On arriving in Korea, he began to explore in great depth its language, culture and history, as well as Classical Chinese. He was an active member of the Royal Asiatic Society Korea Branch, serving on the council, overseeing its publications and serving as its president in 1974. He published several scholarly papers in the RASKB's journal, Transactions, which reveal his deep knowledge of the Classical Chinese used in pre-modern Korea. His deep affection for the traditional culture of Korea, which had almost ceased to exist by the time he arrived, was particularly expressed in his popular 1978 volume, "Korean Works and Days: Notes from the Diary of a Country Priest". His most outstanding work of scholarship, apart from his translations, must be his annotated edition of the "History of the Korean People" by James Scarth Gale, which was first published in 1927. It includes a thoroughly researched biography and bibliography of the author. Rutt was fascinated by traditional, formal "sijo" and older forms of Korean poetry in general. This led to the publication in 1971 of "The Bamboo Grove: An Introduction to Sijo", containing pioneering translations of many of the most celebrated Korean sijo. Like Gale, Rutt was deeply interested in Classical Chinese, and after his retirement he published a new translation of the challenging ancient Chinese classic, "The Book of Changes" in 1996. He also co-authored the scholarly encyclopedia "Korea: A Historical and Cultural Dictionary" with Keith L. Pratt. When he retired as Bishop of Leicester, he gave many of his rare Korean books to the University of Durham and in later years the Bodleian Library at Oxford University acquired the bulk of his remaining Korea-related books. He developed a passionate interest in knitting, and authored a definitive history of the craft in "A History of Hand Knitting" (Batsford, 1987). Characteristically, he collected a unique library of knitting-related books which included some very rare items from the nineteenth century, which he finally donated to the University of Southampton. Brother Anthony of Taizé is an educator and translator of Korean literature who has lived in Seoul since 1980. He taught English literature at Sogang University for about 30 years. The naturalized Korean citizen is the laureate of many translation awards and serves as a judge of The Korea Times Translation Award. His Korean name is An Son-jae, meaning "little pilgrim". ― ED. [Spoiler] Added episode 9 captures for the Korean drama "Warrior Baek Dong-soo"